Inspired by the 1950 John Ford movie “Wagon Master”, Wagon Train debuted Wednesday night, September 18, 1957, on the NBC Television Network. 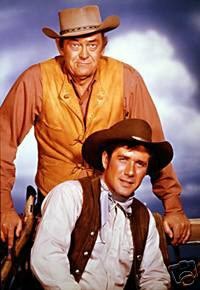 Robert Fuller first appeared on Wagon Train during Season 2 in two guest starring roles. The episodes were entitled “The Ella Lindstrom Story” (original air date February 4, 1959) and “The Kate Parker Story” (original air date May 6, 1959). Both episodes were great opportunities for Robert to develop his acting skills and help prepare him for his iconic role as Jess Harper in Laramie. After a four year run, Laramie ended with the last episode airing May 21, 1963. Within a week of Laramie’s cancellation, Robert received a call from Peter Kelly, vice president in charge of talent for Universal Studios. Mr. Kelly invited Robert to join the cast of Wagon Train and Robert was delighted to work on another western. 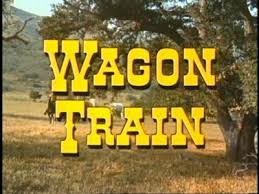 Wagon Train was now on the ABC Network and had just moved to Monday nights. In order to compete with “The Virginian”, Wagon Train Season 7 was expanded to a new 90 minute color format. This change also allowed for expanded stories and continued to attract talented established actors. With his new role as scout Cooper Smith, Robert was determined to develop a character that was not a clone of Laramie’s Jess Harper. He started with a change in wardrobe style and colors dressing Cooper Smith in browns and tans in place of Jess Harper’s blues and black. He also chose to ride a chestnut horse and modify his riding style. Robert Horton played the original scout Flint McCullough for five years and left when his contract was up to pursue his interest in music. Scott Miller joined the cast as scout Duke Shannon for Seasons 4 through 7. Robert Fuller joined the cast as scout Cooper Smith for Seasons 7 and 8. Robert remained the only scout during Wagon Train’s Season 8, the final season. However, the show’s format returned to one hour and was filmed in black and white. Some say the change to black and white was an homage to the early years of Wagon Train. However, because producing color episodes was very expensive, many believe the change was merely a cost saving effort. There were three different theme songs used during the eight year run of Wagon Train. In the third season a new tune was written and conducted by Jerome Moross. “Wagons Ho!” was used for the rest of the series. The song was re-recorded by Stanley Wilson for the final two seasons. Several other artists have also recorded this well-known song with many of them found on western theme song collections. With thanks to James Rosin, author of "Wagon Train - The Television Series" for providing an excellent source of information for fact checking and episode identification.